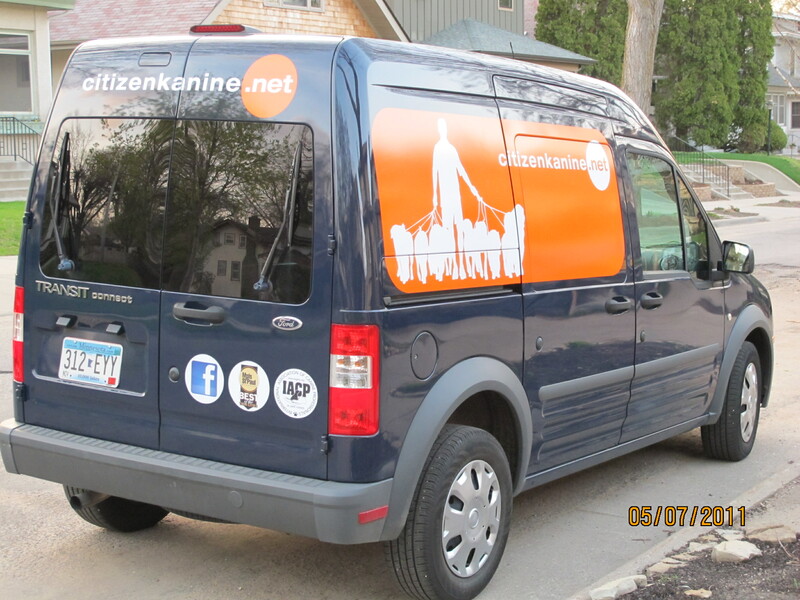 Please come visit us at thecitizenkanine.com. I had a group of 13 dogs out for a stroll around Lake Harriet on Friday morning. A beautiful morning with lots of traffic on the paths. I get stopped regularly and people will ask questions or make comments but I had a more extended conversation with a very nice gentleman riding around the lake on his bike. Here is the youtube link. Paul has a great website to teach american english to people around the world and he conducts occasional interviews with people that he meets in the community. With the heat of a week ago, I stopped at a fountain in Beard’s Plaisance. It was hot – really hot and I had a group of dogs resting in the shade while I got them water. There is a fountain that sticks up out of the ground that is really little more that a fountain head on a pipe and it takes some time to fill the collapsable water bowl, especially when it is windy. The person responsible for Lake Harriet park maintenance was cleaning the shelter and saw my challenge. He suggested that I get a 4 way spigot key from the hardware store so I could get water from the more available spigots around the lake. Yesterday on my walk he stopped me and presented me with my very own water key. The kindness of strangers can be amazing! It was the first day of warm weather with temps in the 60’s. The weather brought out crowds to the lake along with another sure sign of warm weather, the first turtle egg hatch. I found this little guy scurrying across the path toward lake harriet. 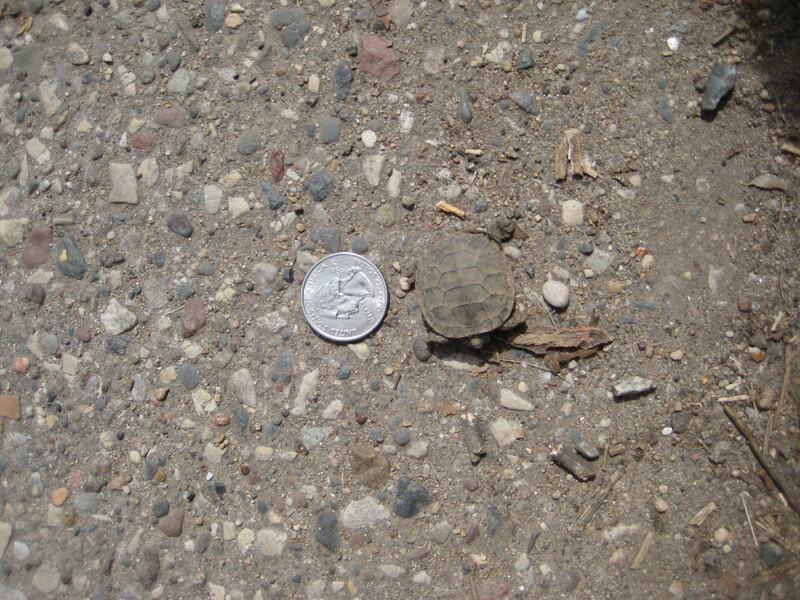 This looks like a little painted turtle that is slightly larger than the quarter added for prospective. One of my old colleagues used to give out an award that he called “The Turtle” with the adage; people are like turtles, we only get ahead when we stick our necks out. Amen to that! Today the forecast calls for rain and the potential for snow. Oh my this has been a challenging winter/spring! 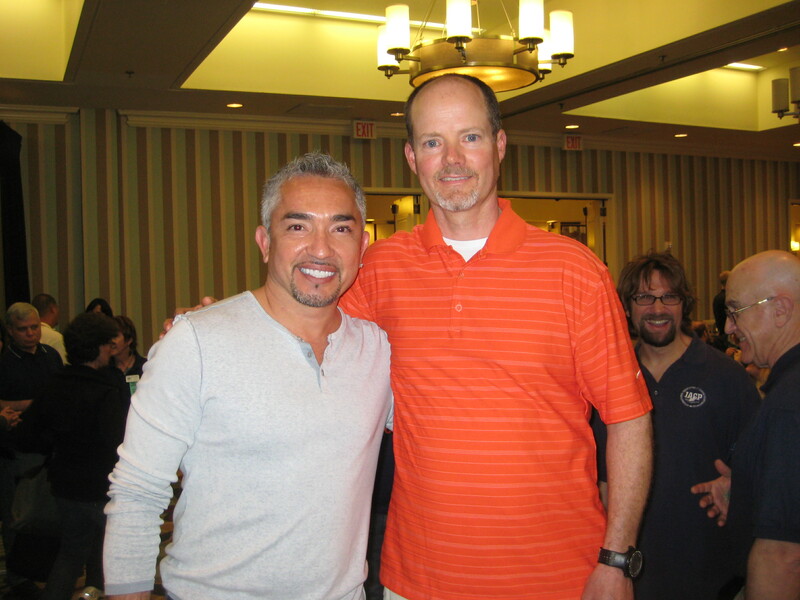 Had a fun opportunity to meet Cesar at the International Association of Canine Professionals (IACP) conference in San Diego last week. While there is some controversy about some of his techniques, his presentation focused not on technique but leadership on the part of trainers, handlers and dog owners. He is an impressive entertainer and has done amazing work in changing expectations about dog (and owner) behavior. Here is a link to a short documentary project for some students at the Minnesota College of Art and Design. It was really fun to work with them on this project. Here is the link. Thanks to Suzy and the team for the great video. The music accompanying the piece is Miles Davis’s Squirrel. An appropriate selection! Don’t hesitate to rate it well!